Dan was behind the anchor desk of Nightline on Monday, January 6th in an episode that went inside the polar vortex as well as investigated pop star, Ke$ha’s choice to enter rehab for an eating disorder. Finally the episode ended with a look at some of the upcoming super bowl ads and if they really work. The episode begins with a look at the polar vortex and the recording breaking, deadly, low temperatures across the United States. 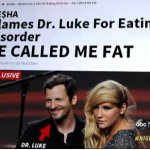 Next, the episode focuses on recording artist, Ke$ha, who has had 10 chart topping hits in the last three years but despite her success, she has been struggling with body image issues and will be in a rehab for an eating disorder for the next 30 days. On her Facebook page, the singer says she needs to ” learn to love myself again”. Finally the episode concludes with a look at Superbowl ads and a recent study suggesting they don’t even help business. So why do businesses fork out millions for them? Watch the full episode here.